Ford’s new compact SUV will be based on the redesigned Fiesta. After , Ford is . The Blue Oval automaker recently unveiled the , and we’re still and its to arrive. 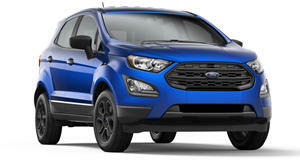 Ford is also developing a new subcompact SUV positioned below the baby Bronco based on the redesigned Fiesta. While the Fiesta is one of Ford’s US car casualties, the compact SUV is expected to , so it could still be sold in the US in the future. The EcoSport has been a slow seller since its US launch in 2017, so its replacement could adopt a new name. Our spies have spotted a camouflaged prototype of the Fiesta-based SUV undergoing testing. Despite its early stage of development, the SUV is already sporting production taillights, whereas the front headlights are clearly still at the prototype stage. Being based on the new Fiesta, it should have a larger, more premium interior than the aging Ecosport, as well as more advanced driver assists and safety technology. Power will most likely be sourced from Ford’s latest 1.0-liter three-cylinder EcoBoost turbo gasoline engines, along with the familiar 1.5-liter four-cylinder diesel unit. The base model will likely be offered with front-wheel-drive, while rear-wheel-drive could be optional for more expensive trims. Ford’s new compact crossover is expected on sale in Europe in late 2020 to rival the Volkswagen T-Cross and Nissan Juke. If it gets the green light for the US, it will most likely arrive the following year as a 2022 model to compete against the Buick Encore, Chevrolet Trax, and Honda HR-V.